A Committee for identification of gaps in border areas facilities to be set up. Uniform and effective implementation of Free Movement Regime by all States along Indo-Myanmar border. The Union Home Minister, Shri Rajnath Singh chairing a review meeting on Indo-Myanmar border issues, in Aizawl, Mizoram on June 12, 2017. The Chief Minister of Mizoram, Shri Pu Lalthanhawla, the Chief Minister of Manipur, Shri N. Biren Singh, the Chief Minister of Arunachal Pradesh, Shri Pema Khandu and the Minister of State for Home Affairs, Shri Kiren Rijiju are also seen. The Union Home Minister, Shri Rajnath Singh chaired the meeting of Indo-Myanmar Border States at Aizawl, Mizoram today. He said that the Government is committed to fast-track development of the North-Eastern region and steady progress in infrastructure development has been made here in various sectors including inter and intra-regional road, rail and air connectivity, power, education, health and setting up institutions of excellence and research in various fields. Shortly North-East will have a string of modern cities under Smart City project, the Home Minister added. Shri Rajnath Singh informed that to address specific developmental needs of border areas along international boundaries, allocation under Border Area Development Programme (BADP) to 17 border states was Rs. 990 cr in 2016 – 2017 which has been raised to Rs. 1100 cr. in 2017 – 2018 and the States of Mizoram, Manipur, Nagaland and Arunachal Pradesh were released Rs. 567.39 cr during the last 3 years. For integrated development of 41 Model Villages, Rs. 92.39 cr were released in the last financial year, which included 3 villages in Manipur and 1 village in Nagaland. He said that for strengthening infrastructure in Indo-Myanmar Border, Assam Rifles has given a proposal for construction of roads and airports facilities for their operational requirement. The Home Minister stressed that the well being of people living in border areas and addressing their basic needs is crucial. He advised the State Governments to pay special attention to the urgent need of improving basic facilities and infrastructure like roads, power, telecommunication, health and education etc. for people in these remotely located areas. He ordered setting up of a committee under the chairmanship of Secretary Border Management for identification of gaps in the facilities in these areas and to prioritize them for filling them up in short term (3 years), medium term (3-6 years) and long term (6-10 years). The committee has also been tasked to find out and pool all the resources and dovetail all programmes of various Ministries of Government of India including those of North-Eastern Council, Non-Lapsable Central Pool of Resources (NLCPR) and BADP and also those of the respective state Governments for achieving these objectives. The committee is required to submit detailed report before December 31, 2017. Greater connectivity within the region and with our neighbours is likely to give impetus to enhanced movement of goods, services and people across the border, the Home Minister said. Improved connectivity and relations with Myanmar are opening new opportunities of growth of this region and Indo-Myanmar border region will be playing a much greater role in near future and therefore, the Centre and the States must be adequately prepared for it, he advised. About the Internal Security perspective, the Home Minister said that although Myanmar border is peaceful and friendly yet it is very sensitive. The Home Minister mentioned that India’s 1643 kms border with Myanmar, touching four states of Arunachal Pradesh, Nagaland, Manipur and Mizoram is unique in many ways. It has a visa-free movement regime for the people living within 16 kms on either side of the border. They can stay up to 72 hrs with effective and valid permits issued by the designated authorities on either side. This regime has been in place keeping in view the traditional social relations among the border people. It helps genuine people living in the close proximity of the border. However, it is misused by militants and criminals who smuggle weapons, narcotics, contraband goods and Fake Indian Currency Notes (FICN). With fast improving security situation in this region, militants are denied hideouts here and some of them have relocated themselves across the border. Taking advantage of the free-movement regime occasionally they enter India, commit crimes and escape to their relatively safer hide-outs, the Home Minister added. For preparing a standard operating procedures common for all the 4 states so that militants, criminals and contrabands are filtered at the border without causing inconvenience to genuine people, Shri Rajnath Singh decided to constitute a Committee headed by Special Secretary (Internal Security), Ministry of Home Affairs which will examine the present rules and regulations adopted by the Border States for implementation of free movement regime along with this border. The Committee will give report for uniform and effective implementation of free movement regime within 3 months. 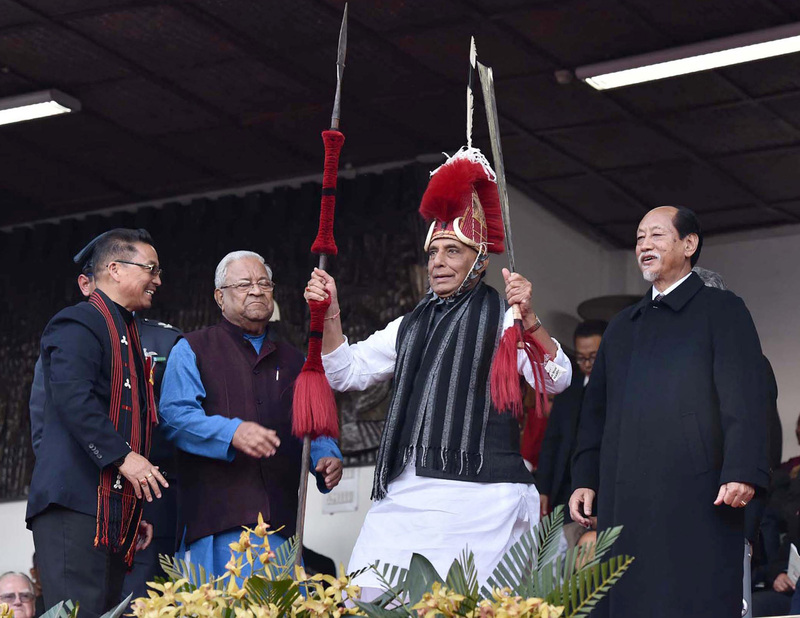 Appreciating the role of Assam Rifles Shri Rajnath Singh said that they are performing their duties with unshakable courage, determination and skills. He urged upon the Chief Ministers to pay special attention to the local issues of border guarding forces to boost their morale and improve their efficiency. Shri Rajnath Singh advised the State Governments to extend co-operation in the survey work for erection, construction of subsidiary pillars for removing differences of perception on ground of zero line and for understanding the boundary demarcation clearly. The Home Minister directed that whatever construction work is required near the border, may be done leaving the ‘No Construction Zone’. He solicited cooperation of Chief Ministers and local population for joint survey of border pillars on the Indo-Myanmar boundary. Mentioning that there are over 240 villages with over 2.5 Lac people within 10 Km of the Indo-Myanmar border, Shri Rajnath Singh urged upon the Chief Ministers to bring these areas under active policing by opening police stations and police posts for re-assuring the people and also to prevent illegal cross-border activities. The meeting was attended by the Minister of State for Home Affairs, Shri Kiren Rijiju, the Chief Ministers of Arunachal Pradesh, Manipur and Mizoram while Nagaland was represented by their Home Minister. The Chief Secretaries and Directors General of Police of the states concerned and senior officers of MHA, Assam Rifles, security agencies and the concerned central Ministries were also present.